For many of our clients, we manage campaigns across several digital channels. This means being able to adapt content to each platform, for maximum engagement and impact. This can be tricky! Content that works well on Instagram as a slider (multiple images in one post) – will not work in the same way on Facebook. And so we need to get creative. Recently we’ve been lucky enough to take on Very Lazy as a client. 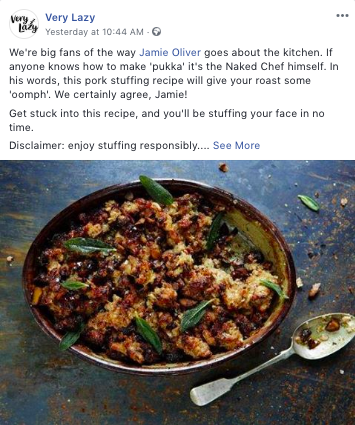 They asked us to inject personality into their brand content, whilst also continuing to share recipe inspiration to novices and foodies alike. 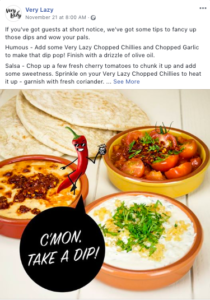 And so, we introduced the Very Lazy clan, a raggle-tag group of fresh ingredients – garlic, chilli, ginger and lemongrass – all sharing the same hope and ambition, to live their best life and become a Very Lazy product. It’s been a fun process! We’re managing campaigns across three digital channels for Very Lazy; Facebook, Instagram and Twitter. These three channels are very different, and they all have their strengths. Facebook is a great hub for all of your best content and key updates. Instagram is where your brand aesthetic is really defined and also where you can engage with fans on a more personal level. Twitter is the place to join in topical conversations. If something is going down in the daily news cycle, you can bet it’s trending on Twitter. A lot of the content we’re creating for Very Lazy will be seen across all three of these channels, but it can’t just be replicated, it needs to be individually tailored to each platform to create the most impact. As part of our Christmas campaign, we’re sharing handy, foodie tips and tricks. Let’s look at an example with our Very Lazy Chocolate Chilli Brownies. 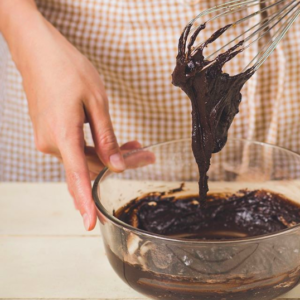 We have a hero photograph of the brownies, accompanied by copy that details the full recipe, with ingredients and the method. Long-form content works well on both Facebook and Instagram. If the audience member can learn something, or take away something of value, they will spend time digesting content. And recipes are a great way of doing this. For Instagram, we have an aesthetic to keep up! Posts may be seen individually but they will also be seen as a whole when people visit your profile. So, the grid needs to be on point! Every post needs to follow on from the next seamlessly and come together to work as one visual, as well as being impactful when seen individually. One way to do this is to create a story across several posts, whilst continuing a general visual theme throughout the grid. For our Chocolate Brownie post, we created a story across three posts, bringing our Chilli character into focus. 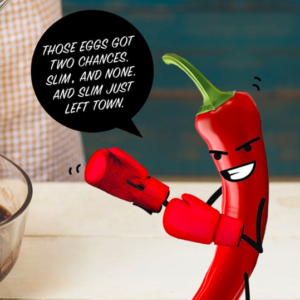 In the first post (remember that the grid runs from right to left) Chilli is paying a homage to Mohammed Ali, remarking “Those eggs got two chances, Slim, and None. And Slim just left town.” Sooo, yeah… he’s trash-talking the brownie mix. 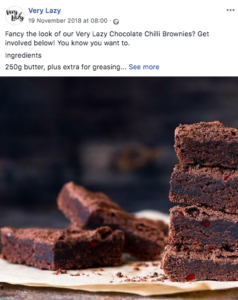 In the next post, we tee up our brownie recipe, telling people to stay tuned for our Very own Chocolate Chilli Brownies. In the last post, we share the full recipe, with ingredients and method – with an image of the brownies, which slides through to an image of the product. What was one post on Facebook, has played out like a mini storyboard on Instagram. For Twitter, the creative will be much the same as on Facebook. However, on Twitter, 280 characters is your copy limit, so long-form is not your friend! In this case, instead of adapting or creating alternative imagery, we’re putting time into making the accompanying copy work. 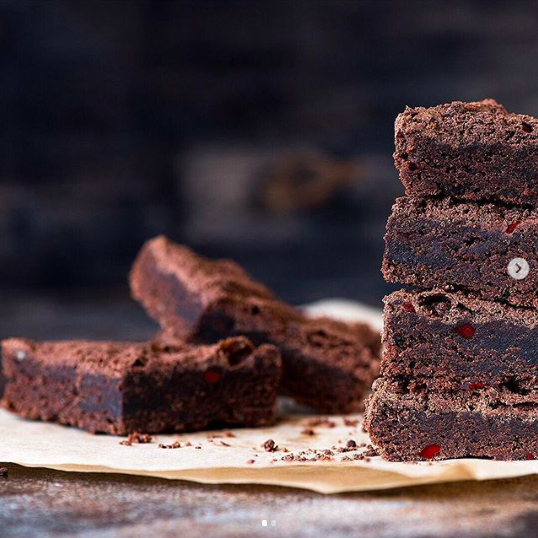 Here, we want to introduce the Brownie recipe, inviting people to read the full thing on our Instagram post with a link. The benefit here is that we’re gaining exposure for our Instagram profile with our Twitter audience! A lot of consideration goes into each and every piece of content we produce for our clients. Everything we create is part of a bigger campaign and serves another purpose beyond that single moment. We work with Designers, Food Stylists, Copywriters, Motion Producers… (the list goes on!) to make sure we create something meaningful and that carries value for our clients and their audiences. To find out how we can engage your target audience with multi-platform campaigns, get in touch.